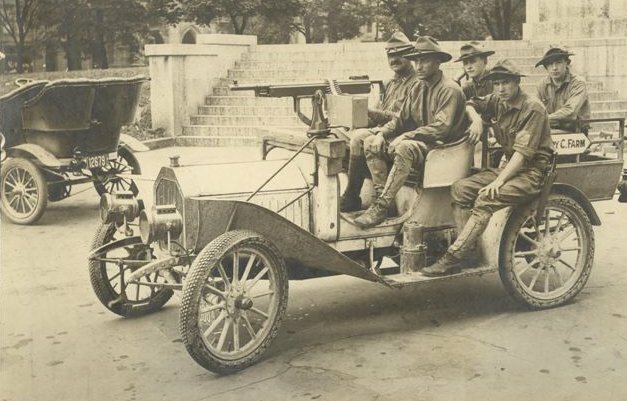 American vehicle mounted Colt/Browning machine gun.
" In 1911, the American vehicle company ' Peerless ' started manufacturing a full line of trucks. They mounted smaller trucks and ambulance bodies on the car chassis, but they also produced three large chassis: a 3-ton, a 4-ton and a 5-ton. These could be fitted with a variety of bodies. Stake body, Dump body, Tractor with trailer or Tractor with a train of trailers. Moving Van body, oil or water tankers...their catalog shows over a hundred different body styles. The truck had the traditional radiator shape but it was larger than the car radiator. The engine was the Peerless T head with 4 cylinders. The wheels were solid rubber 36" front and 40" duals in the rear. This drove jack shafts to sprockets and chains driving the dead rear axle. The US Army purchased a number of these trucks. They were well liked by the Army. When WW1 broke out, England purchased 12,000 Peerless Truck Chassis and used them in the war, supplying the British Army in Europe. At the start of WW1, Peerless changed the corporate name to Peerless Truck and Motor Car Company. In 1919, Peerless stopped producing trucks. When WW1 was over, the US abandoned all their trucks in France. England however, sold their truck depot in Slough, Buckinghamshire and all of their trucks that were scattered throughout the world to a private company. This Company was called the Peerless Trading Company. They brought the trucks back, re-furbished them and sold them for commercial use. This company was in business until the mid 30's. Today, Peerless Trucks are rarer than the Peerless cars. " 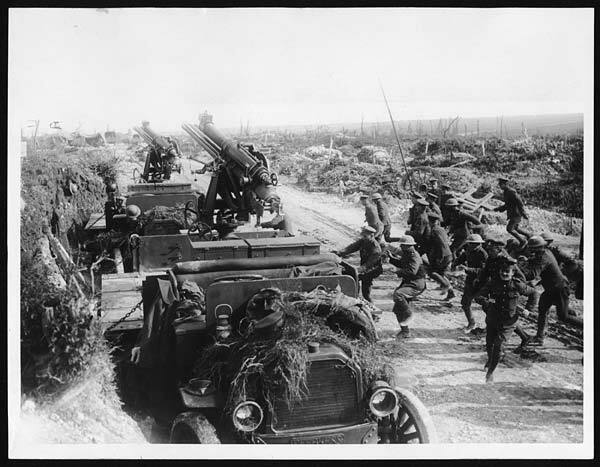 In the attached photograph, we see an Anti-Aircraft unit going into action, with their 13 pdr. Anti-Aircraft Guns mounted on ' Peerless ' lorries.
' Peerless ' truck chassis technical drawing. I have hidden some posts. Members are reminded that photographs from other internet sources may not be copyright free, and are asked to take reasonable steps to ensure that reproduction is permitted. There is no copyright restriction on photographs or other such material published on the internet, unless those photographs or other materials are specifically marked as being subject to a legal ' copyright '. Material published on the internet with no obvious copyright restrictions being notified, is available for any person to use, with the generally accepted norm being ' provided that material is used for information/education purposes and is not used for commercial or financial gain '. Anyone wishing to place restrictions on their ' material ', should either not publish that material on the internet, or should clearly mark their material as being subject to a legal copyright. The other problem which exists, is that sometimes material published on the internet has copyright claims from more than one person. Also, some material which originally had a legal copyright, that copyright has long since expired. Additionally, there are known persons on this Forum, who have a particular ' bee in their bonnet ' regarding every single item being tracked, traced, notated, and documented, which strangely they do not always do themselves. My only advice to them, is ' get a life '. 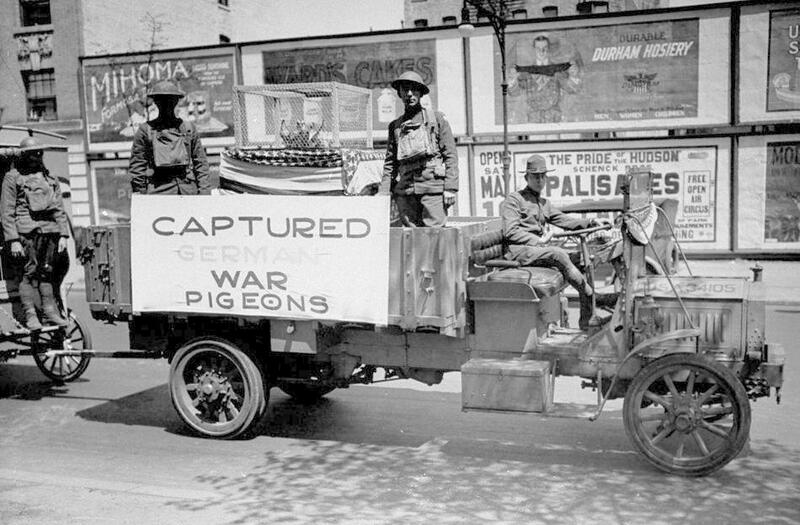 American military parade in which one vehicle is displaying ' Captured German War Pigeons '. This is a photo that Kate & Martin Wills sent to me some time ago. 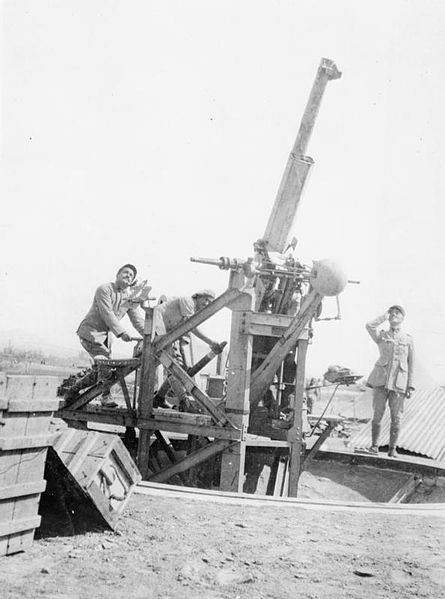 It shows a 13pdr 6-cwt Mk III on a Mk I high-angle mount. The chassis is, I think, a Packard. It shows A Subsection of 98th AA Section in 1918 near Guvesne, where there was a dump. I note your comment. Perhaps you would care to provide UK or US (where our server is hosted), legal support for your statement. Copyright on the internet is indeed confusing, but the GWF Team remain concerned to maintain respect for copyright laws so far as we are able. To that end, where material is posted members are expected to take reasonable steps to assure themselves that an item is free for reproduction, or as in fair use regarding documents, that a small extract is posted to make a point or for illustration. Items reported are liable to be removed without warning if there is a reasonable presumption that they are posted without authority. Moderators will to protect this site be inclined to err on the side of safety. We don't want the GWF full of legal arguments, but nor do we regard it as a free for all for the contentious use of material. If an item is challenged, then we will act not least to protect this site. The image that was withdrawn had an apparent and specific source whether others have copied it or not. I hid rather than deleted it, and will of course happily re-instate it if you can show me evidence that it is legally free of any copyright or that the copyright owner gives his clear, not presumed, consent for it to be used. I hid rather than deleted it, and will of course happily re-instate it if you can show me evidence that it is legally free of any copyright or that the copyright owner gives his clear, not presumed, consent for it to be used. Legal copyright ownership of a photograph is often extremely hard to establish, nonetheless, I may try and establish ownership of that photograph and if I can, I shall certainly be posting it again, if not, there are many millions of other photographs available with no legal copyright whatsoever attached to them, with many now being 100 years old and the original copyrights have long since expired. Could you pm the members that you have hidden to give them an opportunity to provide the evidence that you require? I said that I had hidden posts. Only one image was concerned. There's no rush to hunt around the forum for unauthorised images, just a clear expectation of members to respect copyright, and also a clear likely response from Mods where doubt is raised. Obviously where an item is taken from a public domain area, such as many items specifically released for free use by the IWM it is even better when members quote the source. I can otherwise add nothing to the second paragraph of my post #609. 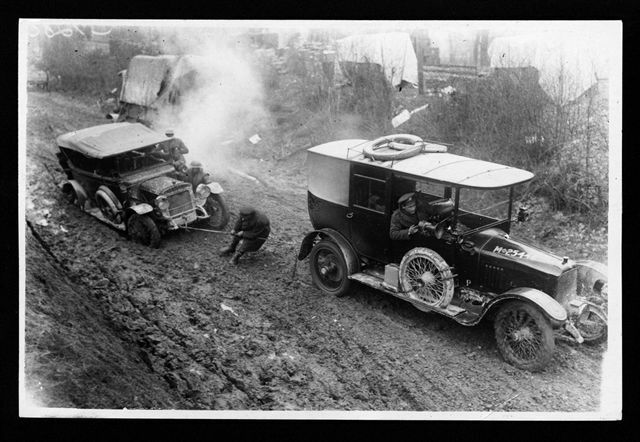 British Army ' Peerless ' vehicle being towed after getting stuck in the ' Salonika ' mud. Again, we see an interesting Divisional/Unit insignia on the side of the vehicle. I wonder what the item on the back is? Looks like a wooden packing crate ? I shall investigate my photo files, and see if there is any additional information. I would agree a packing crate of sorts. Note the 2 civillians behind! Appears the driver tried a short cut and there is a lot of "told you not to go that" way going on. I'm currently working on a blog tribute page about the 2nd East Yorkshire Regiment's time in Salonika and the men from the regiment who died there. I'm interested in all things to do with Salonika at the moment, which is how I spotted the original photo. I certainly don't have any 'bee in my bonnet' regarding the tracking of every item posted on here. I do have a life thanks and better things to do, and as far as I'm aware I've never questioned anyone else's image sources on here, or posted anything myself without giving a source, citation, or a credit to wherever I've found it, which is maybe an old-fashioned concept these days but that's what I prefer to do. 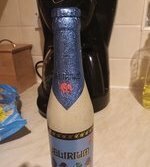 If you find anything I've posted here where I haven't respected this or I have breached forum copyright rules, then please could you point it out to me and I'll willingly remove it. I do have a life thanks and better things to do. I am very surprised that anyone claiming to ' have a life ', would write such a long and needless post apparently about nothing in particular. Although the photo in question was not copyrighted or subject to any copyright notice whatsoever, you complained, the Mods deleted the photo, end of story. I am sure that if I was working on a new project, and someone beat me to the draw and posted a photograph I was hoping to use in my project, I would perhaps also be a little peeved, and would wish to keep that photo under wraps, I fully understand. I am not offended in any way, as there are literally millions of other photographs out there with no copyright restrictions, as was the case with the removed photograph. As to your last paragraph, you were not named anywhere, so I am at a complete loss as to why you would mention yourself in that context, as surely, we would not want to be mistaken as a classic example of ' if the cap fits wear it ', or as the Bard of Avon once said ' the woman protesteth too loudly '. Rather than take up any further space on a serious Thread with an inconsequential matter, let you and I agree that this matter is now amicably closed, you have posted your explanation which I respectfully accept. Anyway, no bad feelings, we are all members of the same fine Forum, let us all work together to get along with each other, and try to respect the other person's viewpoint, which I do. P.S. I have lots of other photographs on Salonkia, and would be delighted to make them available to you if it helped your project, I would genuinely like to be of assistance. PPS. If anyone feels the overwhelming need to comment further, which I hope they do not, as there is no point, the Mods have made their decision, and we must all respect and abide by their decision, be considerate and courteous and move the matter to ' rants for 2013 ' which would be a more suitable venue. I'm sorry but you are not accusing me of anything else, and expecting me not to comment further. I had no intention of using that particular photo on my blog, so nobody 'beat me to the draw' as you so eloquently put it. I would never use a photo from someone else's family album, without a credit and permission. (Edit: Apart from anything else, it is common courtesy and the decent and polite way to do it ) Every photo on my blog has a source clearly stated. What a shame you don't see fit to do likewise. I think you'll find that family photos are under copyright with family members being the copyright holders. Why else do you think that authors write 'published here with the permission of....' when using images in a family's possession in their books? I seem to remember offensive behaviour towards myself and another female member in a different thread (didn't that earn you a ban for a period of time?) and I suspect this has influenced your postings to me here. You have also been extremely rude to one of the admins in this thread, who own the forum you are posting on. How your polite mask slips when anyone dares to question any of your postings. Now accuse me of anything else, either by implication or directly and I will reply to you, if you like it or not. authors write 'published here with the permission of....' when using images in a family's possession in their books? An author publishing a photo for commercial use or financial gain in a book, is completely different to a posting a photograph for educational or shared information purposes, as on this Forum. I cannot recall being rude to anyone, least of all the Admin, and I would welcome you detailing any rudeness you allege I made to Keith ? Keith knows I have not been rude to him, I had no reason to be rude, the Admin made their decision, and I accepted it, as for me, that photograph was of no real consequence, I have literally thousands of photographs in my photo archive, that is one of my hobbies, collecting WW1 images, sadly, you are the one continuing the unwanted correspondence. As I said, the matter is now closed, you have had your say, let us move on, you must have better things to do, I know I certainly have. More examples of atrocious driving conditions at the Front. Two bewildered civilians " only mad dogs and Englishmen drive their fully laden lorry into the river ". There were very few metalled roads in the Salonika Front when the troops arrived and these unmade tracks soon became a mess in bad weather. 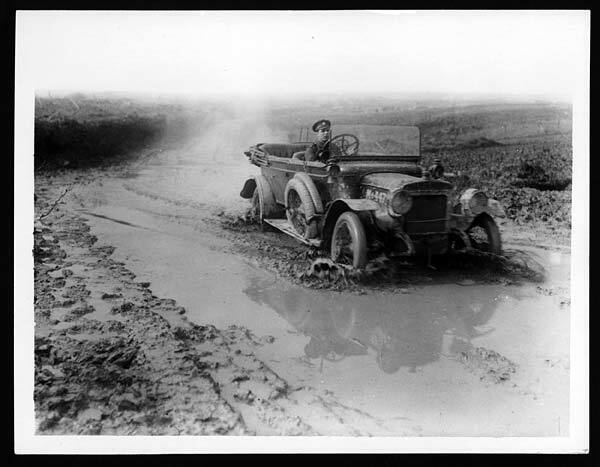 In the north, south of the hills along XII Corps front, there were a number of fords that didn't make life any easier. One of the AA gun-lorries got stuck in a ford near Causica, broke its driving chain and they had to borrow a Caterpillar from a nearby heavy battery to drag in out. Another broke an axle on a Peerless lorry in 1916 and the gun lorry was stranded until they'd taken all the supplies to the new position using the GS Peerless lorries, after which they removed an axle from one of them and swapped it for the broken one. I don't know about the situation elsewhere but lorry spares were very hard to come by at times in Salonika. One O/C of an AA Section records he had a broken cross-member on one chassis that they simply had to live with because there were no replacements. Even tools were in short supply. 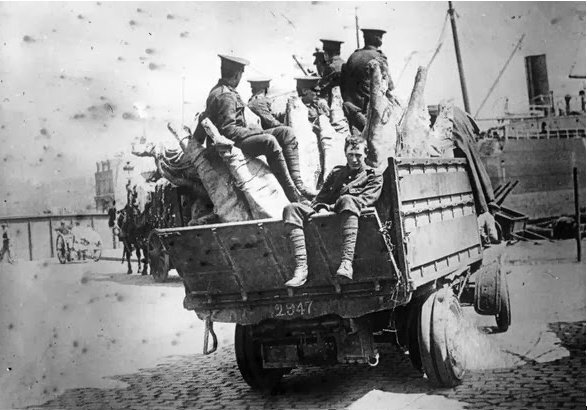 On a positive note, it's said that one of the greatest legacies of the Great War in that area were the roads built by local labour under the supervision of the British (and, no doubt, French in their areas) that were at least nominally capable of handling the intense, wheeled traffic needed to keep supplies moving. If you look closely behind the lorry you'll see that the road it's just left consists of small stones. I suspect that the civilians are some of the local workers I mentioned. Both have long-handled shovels. Many thanks for the excellent follow up information, it looks as though they just veered off that stoned road for some reason. Also, I have another nice photo of a 13 pdr. 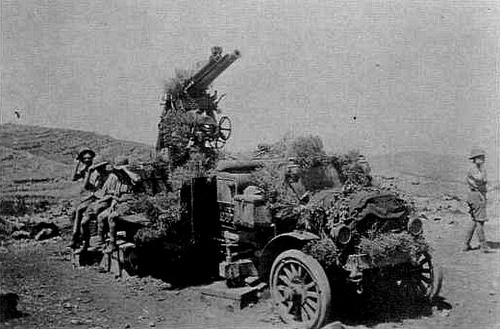 Anti-Aircraft Gun mounted on a Peerless lorry, which I had listed as having been photographed in Salonika, and I would appreciate your opinion. 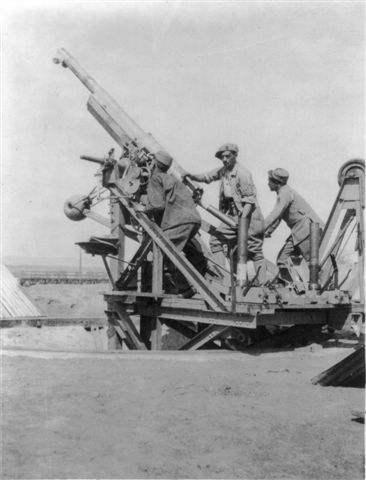 French 75 mm Anti-Aircraft Gun in action on the Salonika Front. ASC vehicle collecting meat supplies from the dockside in Salonika. Presumably, the meat was treated in some way to deal with the hot climate. 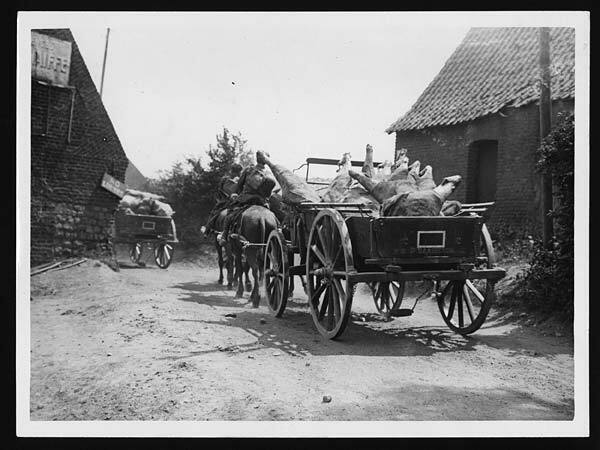 Same process for transporting muslin wrapped sides of beef, this time in France and by horse-drawn wagon, due to their being no lorry access, note the sign on the left ' no lorries '.